The San Patricio Municipal Water District has a focused mission – to provide safe and reliable water to meet the needs of customers in our service area. We work in partnership with city water departments and water supply corporations that provide water to municipal customers. We also work cooperatively with each of our industrial customers in an effort to smoothly and dependably provide the water they need to support continuous manufacturing process operations. 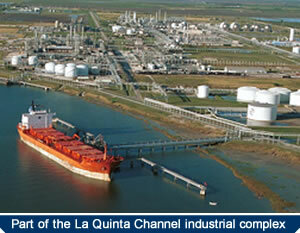 They include Sherwin Alumina, Gregory Power, OxyChem-Ingleside, Ingleside Co-Gen, Dupont and Air Liquide. Our partners also include other local governments and entities that are bound together by contract in the Coastal Bend regional water system. These include the City of Corpus Christi which is charged with managing the regional raw water supply system which includes Nueces River flows, Lake Corpus Christi, Choke Canyon Reservoir and the Lake Texana pipeline and pump stations. The list also includes state agencies such as the Texas Commission on Environmental Quality, Texas Water Development Board, the Nueces River Authority, the Lavaca-Navidad River Authority and the state’s Region N Regional Water Planning Group. Finally, we work cooperatively with San Patricio and Aransas County officials, the San Patricio Drainage District and area landowners. ROCKPORT-FULTON (Est. 2012 pop.- 10,535): Rockport is the county seat of Aransas County and shares the Aransas Bay waterfront with the City of Fulton. Aransas County is a coastal resort and an international birding destination. TAFT (Est. 2012 pop.- 4,508): Taft is an agricultural center for San Patricio County. It is also the nearest community to the turbines of Papalote Creek Wind Farm. ODEM (Est. 2012 pop.- 2,446): Odem serves as a railroad crossroads and an agricultural center including cotton gins and grain storage facilities. The 5,500-acre Nueces Delta Preserve is located at the southern edge of the city. GREGORY (Est. 2012 pop.- 1,910): Is at the intersection of US 181, SH 35 and SH 361, at the gateway to industrial facilities served by La Quinta Ship Channel. PORT ARANSAS (Nueces County Water Control & Improvement Dist. #4): Port Aransas and adjacent areas on Mustang Island form a beachfront resort area and are a major visitor destination in Texas. Gulf and bay waters provide dozens of outdoor recreation opportunities.